True to their name, KleenEarth scissors feature handles made from 70% recycled plastic (including 30% post-consumer content). The sharp, lightweight blades are made of stainless steel. 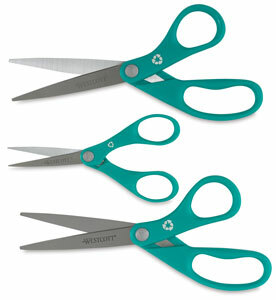 This set contains three pairs of KleenEarth Recycled Scissors, including two pairs of 8" and one pair of 5", in assorted colors. ® Westcott is a registered trademark.® KleenEarth is a registered trademark.